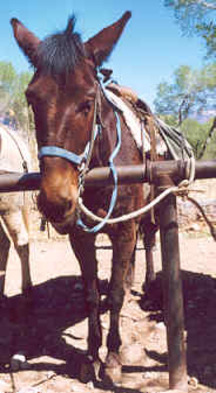 Riding a Mule into the Grand Canyon. Grand Canyon Mule Ride, Arizona, USA. 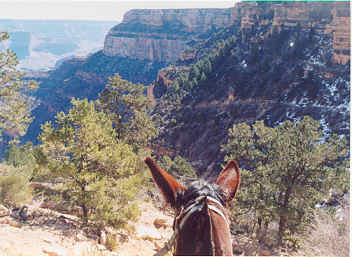 In March, 2002, I visited the Grand Canyon for a second time, this time riding by mule from the South Rim to Phantom Ranch, in the bottom of the canyon, close to the Colorado river. Whilst staying at Phantom Ranch, I attended one of the Ranger sessions, at which we were asked if we would like to write of our thoughts on the visit. Below is my own impression, written in the seven minutes we were allotted to do it, with but two minor amendments to the script as written whilst in the bottom of the canyon. "I came to the Grand Canyon first in July of last year. But even with five previous visits to the United States of America, spending at least five weeks on each visit, even having heard some of the statistics of the area, even having seen such places as Yosemite and the Niagara Falls, I was not fully prepared for what I saw. The last visit was but a fleeting one. With my elder son, (himself at just 22 already a seasoned traveller), we opted for what we thought would be the best way to see as much as possible, a ride by helicopter. But it took me up, and although spectacular, I decided some time that I must go down. 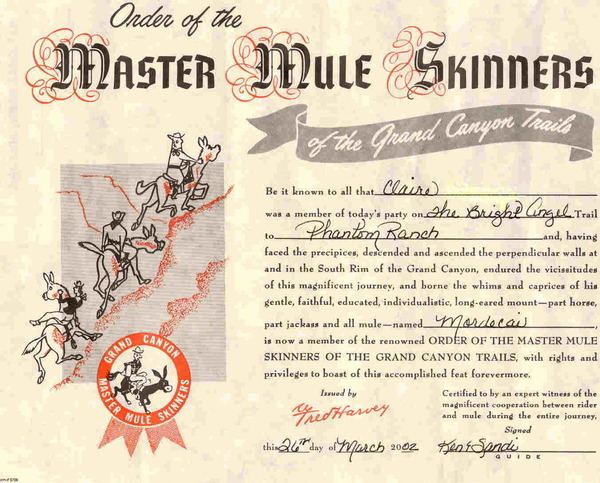 Three alternatives, white water raft, hike, or ride a mule. When Liz, here with me today, said would I like to go with her on the mule ride, I jumped at the chance. Week after week Liz rang, pleading for a cancellation for me. Eventually her patience was rewarded. I prepared as best as I could, read brochures, surfed the net, looked at the March weather patterns. And then, after months of anticipation, and a journey from the UK that took five days, I made a journey which will be forever ingrained in my memory, and for a lesser period on my backside." to be used without permission. The mule who took me down was named Mordecai, and he was an absolute darling. As a result, I had a lot of fun trying to imagine what his thoughts on my riding him down into the canyon would have been if he had been able to tell me. The resulting account is below. As riders go, she was not too bad, a bit heavy but I have had worse. 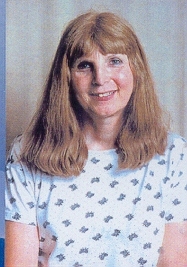 And she did not use that swishy thing all that much, because she soon seemed to realise that I would not need it much. I mean, I nearly always run to catch up the other mules when there is a gap in front of me, and do not need telling to do so. Another thing about her was that she did not seem all that worried about the heights like some people seem to be. It was almost as if she was used to hills. Now I pride myself in walking quite close to the edge, and I have to admit that I do it on purpose sometimes, especially at the beginning of the descent from the top of the South Rim, to see if my rider is easily scared. Now you need to know that I pride myself in being able to walk closer to the edge than most of the other mules, and to be able to stick my neck out over the edge when we stop further than all of them. But she did not seem to worry about this once she had got used to the fact that I always did this when I got the opportunity. One thing about her, that I suppose could have annoyed me a bit was that she seemed to insist on talking to me all the way. But it was nice talk, she would say things like "Good choice Mordecai" when I chose a route that she thought was a good one too, and she always praised me and never chided me. But I really warmed to her when we got down to the stop at Indian Garden. The riders had been told that they could give their mules the apple core from the apple with their lunch if they wished. But my rider, (they called her Claire I seem to recall ) gave me all of her apple. One good munch, and half of the apple had disappeared. But I like to chew my food thoroughly, and she stood there patiently whilst I finished off the one half, waiting for me to take the other half as well. Well I did not need to be told twice. any of the other mules. At the bottom, at Phantom Ranch, she came down and watched us all being unsaddled. We love to roll in the dust of the Corall at the end of the day and she wanted to see this for some odd reason. 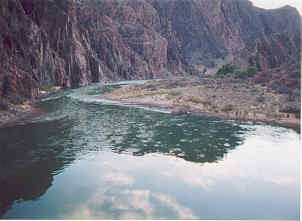 Left : The Colorado River. The following day we went back up the other trail, the shorter steeper one. Somehow I think it is far more difficult going up than down, and I dropped behind once or twice. I sensed that my rider was a bit achy by now, but she still seemed to be enjoying herself, especially when we came to a very narrow ledge where her friend yelled "yikes" several times. It did not seem long until we were at the top again. I hope the next person I have will be a bit more afraid of heights than this one was ! Everyone who completes the trip is presented with a certificate to mark the achievement. Mine is shown below.